and in Change Directory menu, I add an item whose "Command:" is a call to this script. Everything works great, except that there is an annoying brief pause and a cmd window that flashes on screen. It takes about half a second... which is a long enough distraction every time one changes directories, and is totally against the spirit of Total Commander-ism. How can I get rid of the annoying cmd window? Is it possible to define user commands that accept arguments? I can defined `em_foo` to be my usercmd alias for calling `foo.bat` with "minimize" etc settings. Then I can add various Ctrl+D items that uses em_foo with the argument. In the lack of this capability, I'd have to declare additional usercmd's, each repeating the same settings with minor variation. 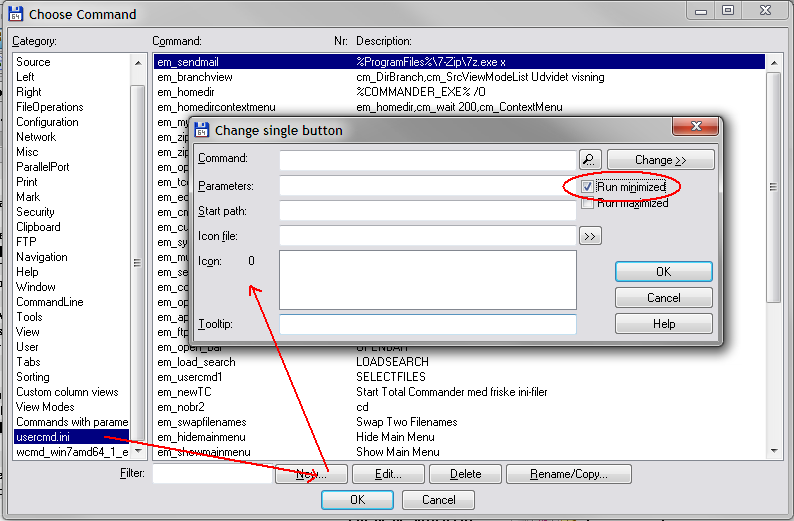 With this, you can use the em_cmd from the command line, for button with popup (if you added ? ), sending messages with scripting language.